An Alley? Hardly, dining paradise with a bonus: shade. Food is everywhere in Bangkok. Correction- great food is everywhere. In restaurants, open air ‘shops’, stalls and on the sidewalks, you’re never far from some really good Thai food. This is a picture of an alley in Ari, loads of food stalls with the bonus of a respite from the sun. This picture was taken mid-afternoon, the alley is so crowded during lunch time you wouldn’t be able to see many stalls through the mass of people. 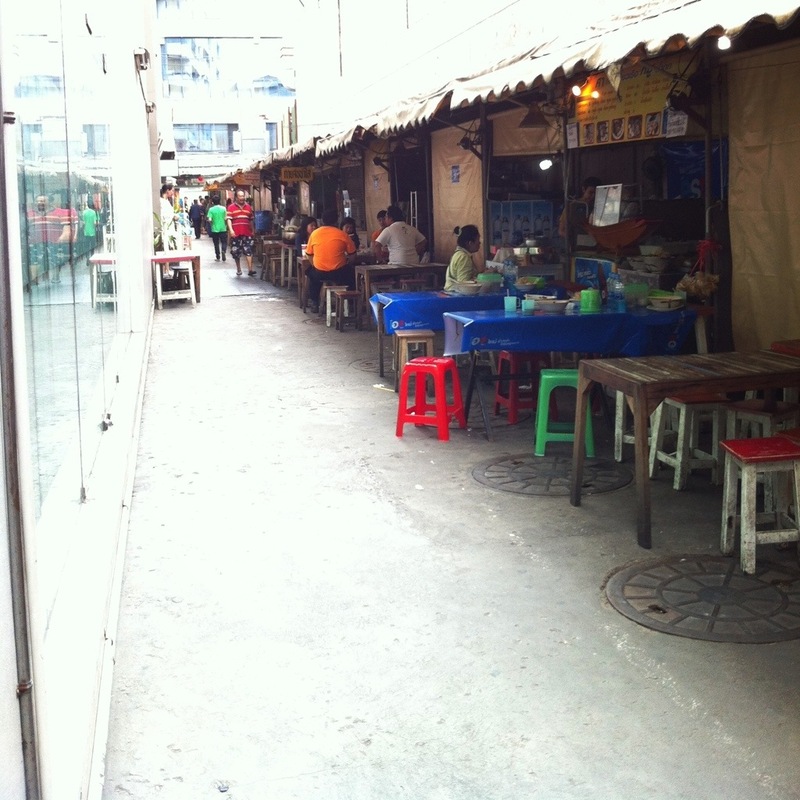 Yet another benefit of life in Bangkok: ‘food alleys’, and there are many of them. This entry was posted in Food & Restaurants and tagged Bangkok food stalls, street food. Bookmark the permalink. About 2 stalls in from where the camera is positioned is where I got about 16 oz. of fresh squeezed vegetable juice everyday. The stall was operated by a nice young woman and either her husband or older brother. I would get off the Ari BTS, cut through this alley and grab a Veg. Juice, then get some grilled chicken and Somtam right on the next block. I stayed at a place called Bangkok Living Apartments up on Pradiphat. Can’t wait to get back to this place. Strange, beautiful, compelling city and people. I understand your self-directed question from one of your posts . . . “how can I leave Bangkok” . . . hard to explain to those who have not been there / or do not connect with the city. I intend to live about 10 months in BKK and 2 months in the U.S. . . .